It is with great pride and excitement that we enclose the information packet in providing a minimum of four $500 scholarships to high school seniors. Any daughter, son, stepchild or grandchild of a CEA member in good standing is eligible. The deadline date for CEA to receive full submission must be received by March 15, 2016 to be eligible. We urge you to review all of the attached requirements. Individual members are permitted to submit one application per household. The contact for the CEA Scholarship can be reached at and a copy of this application can be found on the CEA website: and go to Scholarships. Please feel free to contact me should you have additional questions. In addition, the Board of Director’s are available to help answer any questions. We look forward to receiving submissions from you or your employees; children, stepchildren or grandchildren. Let’s make their road ahead a little easier with our check. Please note that the files may download into your downloads folder and may need to be opened. 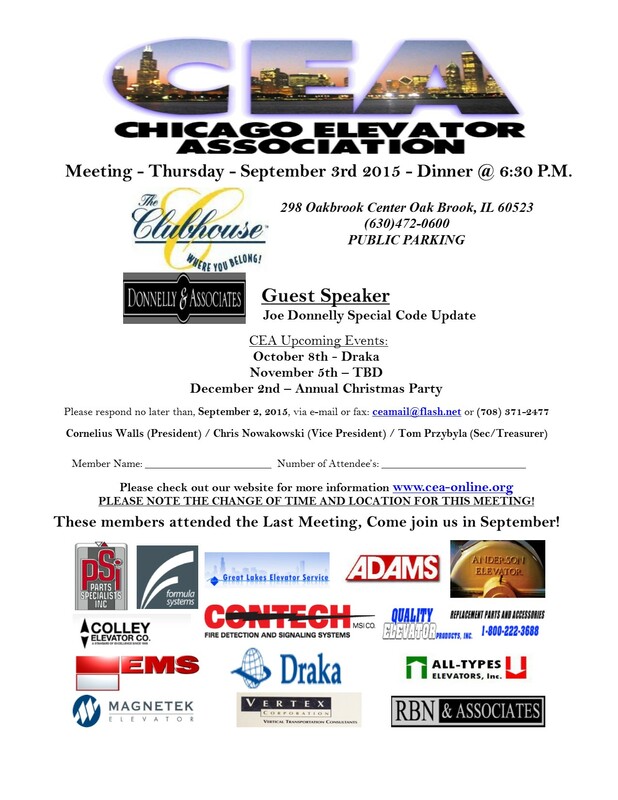 Meeting – Thursday – October 8th 2015 – Dinner @ 6:30 P.M.
Join us for our first CEA Meeting after our summer break. Special thanks to Glenn and Tommy and the others on the CEA Golf Outing Committee who once again produced a fun event. Also to the sponsors who supported it we couldn’t have done it without you. The event had a 50/50 drawing for the EESF. The CEA would like to Thank Brad Hunt of the Peelle Company, Tim Kelley of Tri-Tronics, and the girls from RelaDyne for helping with the collection of $2520.00 dollars for the drawing. Half went to the winner and the other half to the EESF. We also raffled off a Chicago Blackhawks sweater, which was the special Red, White, and Blue version of Marion Hossa’s 2015 Stanley Cup Winning sweater. We collected $480.00 dollars for the raffle of the sweater. This years EESF charity event was a huge success. The CEA Annual Golf Outing helped the EESF by raising $3000.00 dollars to further their mission.